Gumberg Library has raised $ 2,425 from 28 gifts! 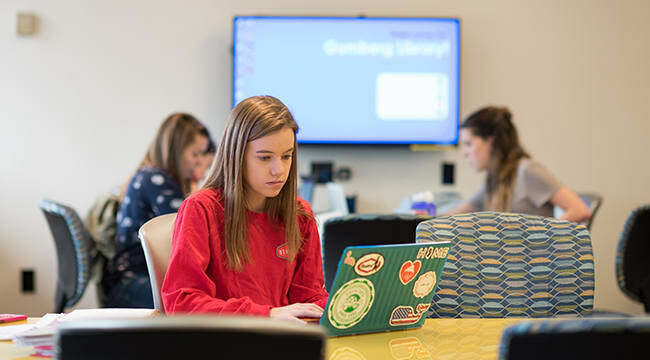 The Gumberg Library is a hub for academic exploration, distinctive intellectual resources, information literacy instruction, and expert library services for the Duquesne University community. The five-story structure boasts individual and cooperative study areas, private and group study rooms, a FlexTech classroom with seven collaborative work spaces, a rare book reading and seminar room, assistive technology equipment and tables, and color and 3-D printing. Several unique special collections that are recognized locally, regionally, nationally and internationally are part of Gumberg Library including The Maureen P. Sullivan Curriculum Center, The Simon Silverman Phenomenology Center, and collections found within the Special Collections and Archives. Our vision is to elevate student and faculty success and enhance the reputation of Duquesne University.